In realistic acquisition systems, measurements must be discretized with an analog-to-digital converter. Practical ADC does not only sample, but also quantize each measurement to a finite number of bits. Therefore, during the reconstruction stage, quantization should be considered as well as sampling. In this project, we explore the extreme case of 1-bit quantization, which captures just the sign of the measurements. 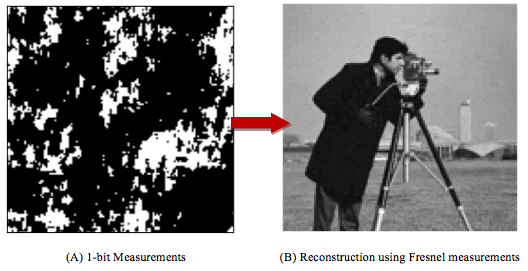 The goal is to determine a suitable forward model for reconstructing the image from 1-bit measurements. In particular, we find that Fresnel measurements provide sufficient amount of information for image reconstruction. We use BIHT algorithm for recovering the signals. Our final conclusion is that 1-bit Fresnel measurements together with BIHT have the potential to yield high-quality reconstruction.